On March 18th, 2019, WHS members received scholarships to attend the Barbershop Harmony Society's week-long "Harmony University", held annually in July, at Belmont University in Nashville Tennessee: harmony-university. Adrian Smith, Dave Chernoff, Billy Gilliland, Mike Johnson, Emery Cherot, and Tim Hines. We are gearing up for a number of performances during this Christmas season. Our first performance is our guest spot on Rhythm of the Rockies Christmas show on Saturday December 1. In this blog (and email) you will find information that you need for that performance. On Thursday, January 11th, 12 members of WHS helped at the Calgary Food Bank as volunteer workers. Again this year they had a little something extra to contribute, in addition to their labour. Last year, in January, we donated $ 5,000.00 raised from our December 2016 Christmas shows..
A donation of the $ 11,000.00 net proceeds of our 2017 Christmas shows was given to Food Bank CEO James Mc Ara. Twice as much to celebrate! We thank all of our loyal supporters who attended our shows and donated by buying a ticket ! 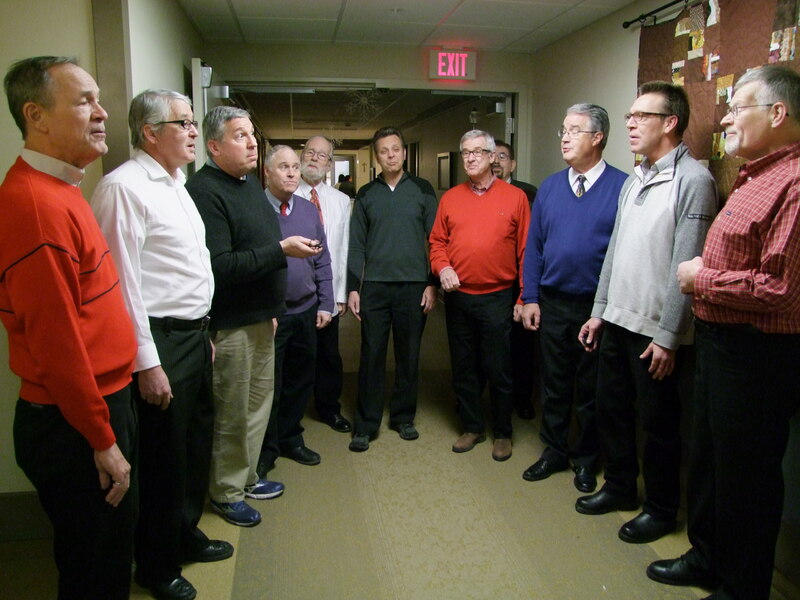 Members of Western Hospitality Singers performed as a VLQ (or Very Large Quartet, consisting of 8 to 12 men singing in 4 part harmony), in the common areas and patients' rooms (on request) at six Calgary hospices on the evenings of December 5th, 6th, and 7th. This is an annual initiative, in co-operation with The Bearspaw Lions Club, to bring some Christmas spirit into the lives of palliative care patients and their loved ones, at a very meaningful time in their lives. Singing Valentines are fun. Crystal works here in Calgary for a foundation that works with adolescent and adult autism. The sender of the Valentine was Larry, her boyfriend, from the Vancouver. The quartet is the newly registered "Blend The Rules". Matt could not make it today so Bob sang lead and Doug filled in on bari. Murray is tenor and Craig is bass. Western Hospitality Singers worked and sang at the Food Bank, part of our "We Sing, We Serve" mission. On Wednesday, January 11th, members of WHS again visited the Calgary Food Bank as volunteer workers. This time they had a little something extra to contribute, in addition to their labour. On behalf of Western Hospitality Singers, the volunteers presented a donation to assist the Food bank in its worthy efforts. A cheque representing the $ 5,000.00 net proceeds of our Christmas shows was given to Food Bank CEO James Mc Ara. First there's work - then it's not unusual for singing to break out. A number of Western Hospitality Singers members sang for patients and their families at six Calgary hospices in the evenings of December 6th, 7th, and 8th. The number of men who joined in a VLQ (Very Large Quartet) varied between 9 and 13 each night. This is an annual outreach project for the chorus, sponsored and organized by the Bearspaw Lions Club. We appreciate the opportunity to share the gift of song with those having a difficult Christmas season. A group of WHS members, informally known as the N.W.M.P. (North West Music Project) sang Christmas songs and carols at midday on Wednesday December 7th, at the Meals on Wheels driver appreciation luncheon, and then later for a senior card group at Corpus Christi Church.